In some ways, I'm already fed up...how about you? I find myself a little irritated when it's not even the end of October and I walk into stores to find Christmas decorations up and Christmas music being piped throughout the store. Remember how the day after Thanksgiving used to be the official start of the Christmas season? I do. And I miss it. With Christmas being stuffed down the throats of my children for months in advance, I feel them becoming more commercialized each year and, in small ways, losing sight of the true meaning of Christmas. It's Rebekah's favorite Bible verse, John 3:16, "For God so loved the world, that He gave his only son, that whoever believes in him shall not perish, but have eternal life." She loves that verse and I encourage her to think about the meaning of the verse. God gave us the gift of His only son at Christmas. Sent to die in order to save all of us so we might live forever in Heaven with God. Wow! 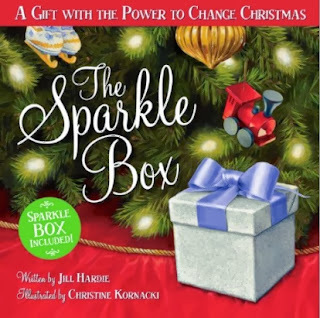 When Rebekah and I read "The Sparkle Box," I knew I had found one answer to my Christmas commercialism dilemma. My boys were listening in as we read the book...although it's 'too young' for them. But they pointed out some of the beautiful illustrations, so I know they were paying attention. Spoiler alert--I'm going to tell you what the Sparkle Box is all about. The Sparkle Box is a box where you write down the gifts you give to Jesus during the holiday season. Do you donate food to the pantry, give a gift to a person in need, serve with your time or talents as a volunteer? Do you give mittens or hats to a mitten tree? Sponsor a child overseas? Send a shoe box with Operation Christmas Child? All of these are gifts to Jesus that would then be written on a slip of paper and added to the Sparkle Box. On Christmas Day, you open the Sparkle Box and share with your family all the gifts you gave to Jesus during the Christmas season. My favorite part of the book? There's a Sparkle Box included in the back inside a pocket where you can store it for years to come. There are suggestions on activities, and if your sparkle box ever gets a little too worn, there are instructions to make a new one. I get to share The Sparkle Box with you. Keep reading to find out how to enter my giveaway. One reader will win a copy of this book for yourself. Author Bio: Author Jill Hardie and her family began placing a gift for Jesus under their Christmas tree as a way of bringing more meaning to the holiday. The first time they opened His gift, the commercialism of the season melted away and they felt a profound joy and peace. Jill hopes that The Sparkle Box will spark a new Christmas tradition, bringing light into thousands of lives. Illustrator Bio: At a very early age, Christine Kornacki developed a love for painting and bringing stories to life. After receiving a BFA in illustration from the University of Hartford, her dreams of illustrating children's books began to take shape. She spends her days painting in her studio, which adjoins a charming cafe in New Haven, Connecticut. Disclosure: I received a copy of the book in exchange for my honest review. All thoughts and opinions are my own. Prize fulfillment is not the responsibility of Coolestmommy.com and questions regarding fulfillment should be directed to Fly By Promotions.